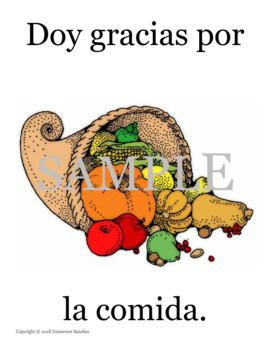 This simple Thanksgiving story practices Spanish vocabulary for people/things to be thankful for as well as Thanksgiving food vocabulary. 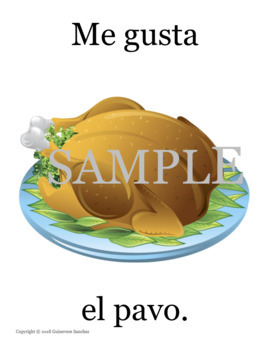 There is a full color story for the teacher to display on a large screen and read with the class. There is also a one page black and white version of the story that students can read on their own or to a partner. Once they have read the story, they show understanding of the story by drawing their own pictures of the story. 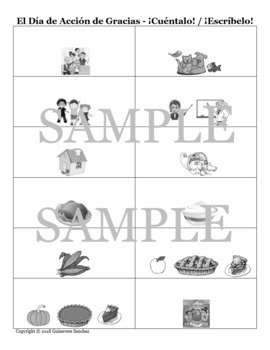 Additional extension activities are included to allow the students to look at only the pictures of the story in order to orally re-tell the story and even re-write the story on their own. The students have an "I can" page to check off all that they can do. Full color story included plus 4 student pages. See my store, Señorita Sanchez Productions, for more fun stories!